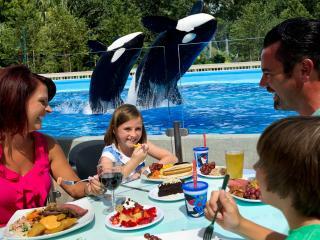 It's Orlando's most immersive and memorable family dining experience....Up-Close Dining at Shamu Stadium at SeaWorld Orlando. Dive into Orlando's most immersive and memorable family dining experience. Dine next to SeaWorld's resident pilot whales and as you hear the story of their incredible rescue and watch the specialized care they receive daily in their forever home. Following your meal, you'll get an up-close view into the relationship shared between our trainers and killer whales as you discover the unique characteristics of these majestic animals. Throughout your experience, you’ll learn about the small yet impactful measures we all can take to help save valuable ocean resources by enjoying sustainable foods and preserving natural habitats. SeaWorld’s commitment to care for the natural world extends into the food they serve. The Up-Close Dining at Shamu Stadium buffet-style menu features sustainable, organic, seasonal or locally grown ingredients. Please Note: The Up-Close Dining at Shamu Stadium price is in addition to park admission, a separate entrance ticket to SeaWorld and will still be required. This tour must be booked in advance and you must select your chosen date at the time of booking. Up-Close Dining at Shamu Stadium prices are in addition to park admission, a separate entrance ticket to SeaWorld and will still be required. Up-Close Dining at Shamu Stadium at SeaWorld will take place at 12.30pm. Guests will need to check in at Information and Reservation counter no later than 11.00am. All members of your party must have a reservation including infants. Photo ID will be required. The Up-Close Dining at Shamu Stadium meal is an all you care to eat private buffet. Should you have any concerns about food allergens, please mention this when you call to confirm. Viewing of the rescued pilot whales could be withdrawn at any time without notice. The interaction with the killer whales will take place in the front pool at Shamu Stadium after the meal.